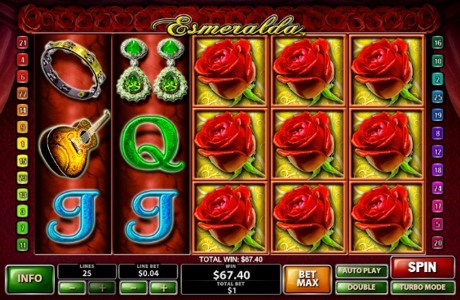 Esmeralda is a 5-Reel, 25-line Video Slot featuring literary world's famous character Esmeralda from the Victor Hugo's "The Hunchback of Notre Dame". Roses and red curtains frame the reels and the background music adds a latin feel to slot's vaguely romantic atmosphere. Wild: Esmeralda herself is the Wild icon and the Red Rose is the Scatter which is the key to the main free spin style feature. Even more free spins can be added to to the total by landing more Red Roses within the bonus feature spins. Land 5 Wild Esmeralda symbols on an active payline to win the progressive jackpot. You need to be playing maximum paylines (25) and bet at least $2.00 per spin to qualify for the jackpot. You'll see different jackpot values for the following possible bets: $2, $5, $10 and $25. Note: Different coin sizes correspond to completely differently managed jackpots. Use SCORES to pick the right pot. You could also win the jackpot during the free spins.